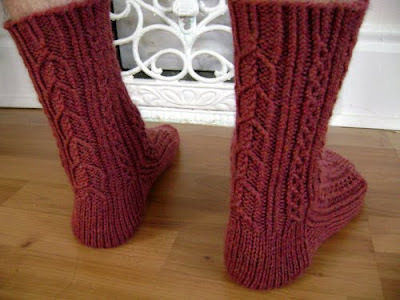 spillyjane knits: You can't even approach the flava..! ...of my Colognac. Erm, I mean Köln socks. From the front: and from the back: Yes, the socks shown are men's socks. 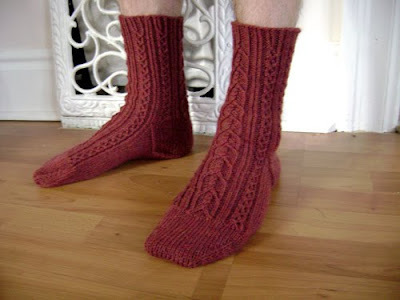 The pattern will also offer woman-sized socks, so fear not. I polished these off yesterday, while I was working al fresco. 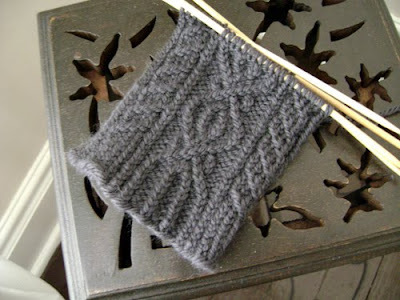 I fear that my days of knitting outdoors this year (at least in my area) are sadly numbered. Luckily that means it'll be time to actually wear the things that I've spent all that time making. In fact, I started one such project today, may they be done and wearble very, very soon: This is the relatively early beginning of a pair of fingerless mittens (gauntlets.) Yes, you read that correctly. I am fighting the urge to put fingertips on these critters, at least this time around. Frankly, what astounds me more than the fact that I am actually purposefully knitting things without fingertips is that I'm not yet totally burnt-out on all this twisted-stitch knitting. It can get intense at times, that's for sure. October 8, 2009 at 7:31 a.m. I am intrigued by these twisty gauntlets... I may have to bite the bullet and follow a pattern for once! October 8, 2009 at 7:32 a.m.
You are a pattern *machine*! A beautiful pattern machine. Love these socks. October 8, 2009 at 8:41 a.m.
October 8, 2009 at 9:00 a.m.
October 8, 2009 at 9:45 a.m.
Must have the pattern for these socks and the coming gauntlets!!!!! How can I get them? October 8, 2009 at 2:40 p.m.